Hard drinking socialite, Nancy Archer (Allison Hayes) encounters a strange white sphere in the road. A giant hand lunges out to grab at her, but she runs away. Her two-timing husband, Harry (William Hudson) sees her story as an opportunity to have her committed, so he can take her money and run off with local girl, Honey (Yvette Vickers). Nancy becomes with obsessed with finding the ship and proving that she isn’t crazy. Eventually she and Harry do find it. Harry panics and runs, leaving Nancy to her fate. That fate is to become a 50ft giant who would like nothing better than get revenge on Harry and Honey. What I appreciate the most about Attack of the 50ft Woman is the fact that there are no squeaky clean heroes. Many SF and horror movies from the 1950s will have their fair share of morally questionable people, but there is almost always at least one square jawed hero in place to represent what is ‘normal.’ The closest we come to that in this film is probably Nancy Archer’s butler, Jess (Ken Terrell) who is loyal to a fault. Everyone else is various levels of incompetent and selfish, from Nancy’s philandering would-be murderous husband, to the feckless deputy who is completely ineffectual. There’s a delightful kind of ruthlessness throughout the movie, people take advantage of each other, bad things happen, and lots of people die. Even though the actual attack probably occupies less than ten minutes of the film, there are a number of strange moments leading up to it. 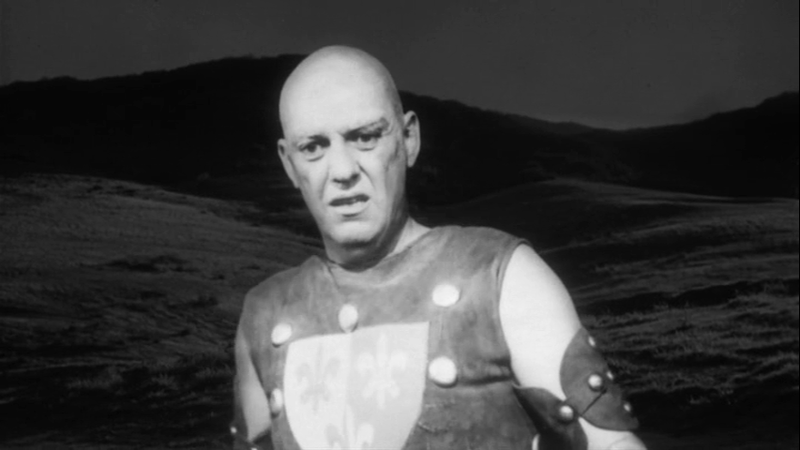 The alien spaceship is a featureless white sphere, and inside is a huge bald humanoid wearing what appears to be a gladiator costume. In Nancy’s first encounter with the alien, we just see this enormous rubbery hand extend out the swipe at her. It’s a moment that is both comical and just a surreal enough to be a little unnerving. Later scenes where characters find the sphere just sitting quietly in the desert, and explore the interior add just enough weirdness to the movie’s parade of sleazy behavior to give it an interesting narrative texture. "Uh, that's not what we meant, when we said, 'Raise the roof, ' Nancy." The special effects err mostly on the cheap side. The giant alien is badly matted into his scenes, but then again maybe he was meant to be mostly transparent. The single huge rubbery hand is used both to represent the alien and Nancy attacking things. The camera seems to linger on it clumsily flopping around for comically long periods of time. 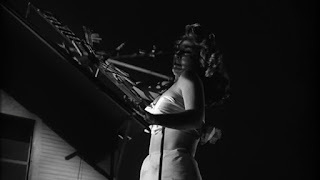 On the other hand, Nancy does get to tear off the roof of a bar during the climax, and the model work is rather good. As you might expect, the size of the giants is very inconsistent, and for some reason Nancy completely changes her hair after she grows. In a normal film these things might be problems, but in something as loopy as Attack of the 50ft Woman, than can only be viewed as features. Even sleazier and stranger than its title would suggest, Attack of the 50ft Woman, is an enjoyable low-budget mess. It’s only sixty-five minutes long and it uses every one of those minutes to maximum effect.